Like a modern-day Jane Jacobs, Janette Sadik-Khan transformed New York City's streets to make room for pedestrians, bikers, buses, and green spaces. 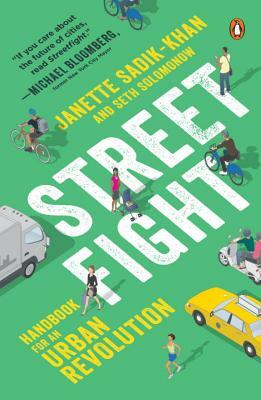 Describing the battles she fought to enact change, Streetfight imparts wisdom and practical advice that other cities can follow to make their own streets safer and more vibrant. Janette Sadik-Khan is one of the world’s foremost authorities on transportation and urban transformation. She served as New York City’s transportation commissioner from 2007 to 2013 under Mayor Michael Bloomberg, overseeing historic changes to New York City’s streets—closing Broadway to cars in Times Square, building nearly 400 miles of bike lanes, and creating more than 60 plazas citywide. A founding principal with Bloomberg Associates, she works with mayors around the world to reimagine and redesign their cities. She chairs the National Association of Transportation Officials, implementing new people-focused street design standards that have been adopted in 45 cities across the continent. She lives in New York City. Seth Solomonow is a manager with Bloomberg Associates. He was the chief media strategist for Janette Sadik-Khan and New York City’s transportation department under Mayor Michael Bloomberg. A graduate of Columbia University Graduate School of Journalism, Solomonow has written for The New York Times and his hometown newspaper, The Staten Island Advance. He lives in Brooklyn, New York. "Sadik-Khan's work will serve as a guidebook to city planners and traffic engineers everywhere, and motivate disenchanted urban dwellers to urge local politicians to make their cities more liveable."